About two decades ago, we were first introduced to skybridges. Cesar Pelli, the famed Argentine American Architect, was explaining how his firm and Thorten Tomasetti, a structural engineering behemoth, devised a clever way to erect and support the tallest skybridge in the world at the Petronas Towers in Kuala Lumpur. Suspended 300 feet in the air, the enclosed walkway allows occupants to go from one tower to another without coming down to ground. Since then, we have paid close attention to skybridges in New York, where we have handsome models to view; if you have an afternoon free, it is worth spending a few hours to discover these mid-air marvels. 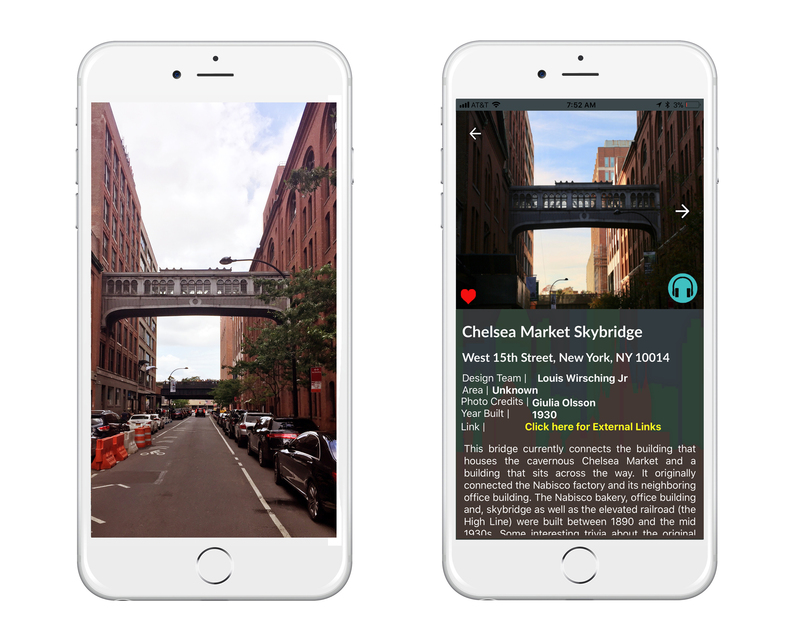 To make things easier, we have coded the 10 most recognizable skybridges into Labyl, a free architectural way-finding app for iPhones. Skybridges, as their name suggests, are elevated enclosed walkways designed to allow patrons easy access between mid- and high-rise buildings, thereby saving folks the trouble of traversing back down only to go up again. One of the first retail companies to use a skybridge to attract customers was Gimbals, an American department store and competitor to Macy’s. In 1925, their three-story, copper skybridge, designed by Shreve, Lamb and Blake of Empire State Building-fame, opened above 32nd Street. The bridge was a novelty at the time, giving patrons easy access between their stores. Gimbals folded in 1987, but fortunately for New Yorkers the skybridge survived and continues to impress. These mid-air passageways were also time-savers for businesses like Nabisco, the cookie giant, that used to occupy the Chelsea Market building. The skybridge above 15th Street provided a connection between its factory on the north side and its offices on the south side. Nabisco moved on but the skybridge still provides (private) access between offices. Similarly, Bloomingdales’ skybridge, which is still operational, enables employees and customers an easy way to connect at the 3rd floor between its shopping center and offices. One of the more modest bridges resides in Tribeca. The Staple Street Skybridge connected the New York City Hospital House of Relief’s original and expanded properties. The structure is now privately owned by a famed fashion designer who uses the passageway to go between a townhouse on Jay Street and a loft on Hudson Street, a convenient live-work arrangement. As recently as 2016, the two townhouses and bridge were on the market for a staggering $50 million. The latest addition is the skybridge at the American Copper Building at 626 First Avenue. Designed by SHoP Architects, the structure is the highest in Manhattan and connects the two swaying towers with an amenity-filled indoor space. It is hard to imagine that this is the first skybridge to be built in 80 years. Unlike its predecessors, this is a predominantly glassy enclosure with unparalleled views of the city and Queens. There is something interesting to see at every level of New York’s built terrain, from manhole covers to roof gargoyles, and it’s easy to miss these clever constructs if you aren’t paying attention. So, the next time you are talking a stroll, make sure to look up, down, and all around for hidden architectural gems.